a parisian in grey part II. | owl's house london. a parisian in grey part II. The designers job, in this case, was to allow the home to adapt to a contemporary lifestyle whilst maintaining, along with the period mouldings and fireplaces, its essence. Circulation through the space has been simplified, alignments and vistas created. Individual rooms remain but are opened up, allowing an open plan layout or closed off, as required. 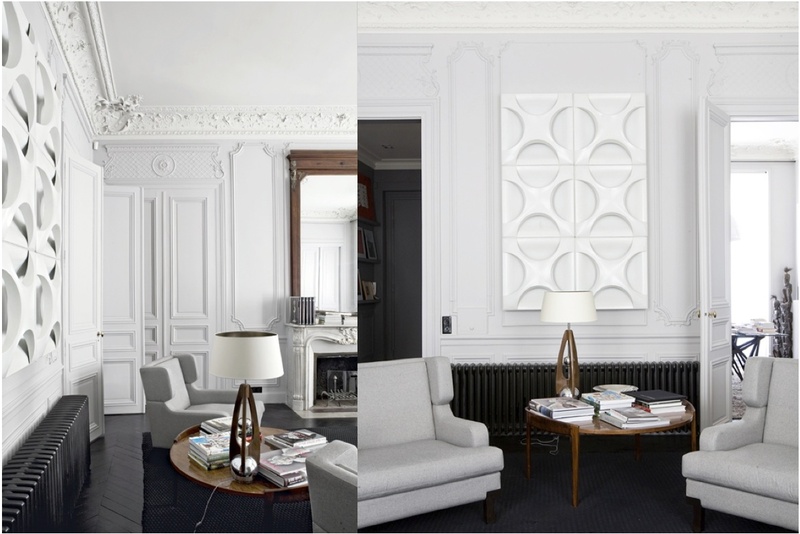 From palest pearl to anthracite, grey is again the predominant wall colour, this time accented with white. 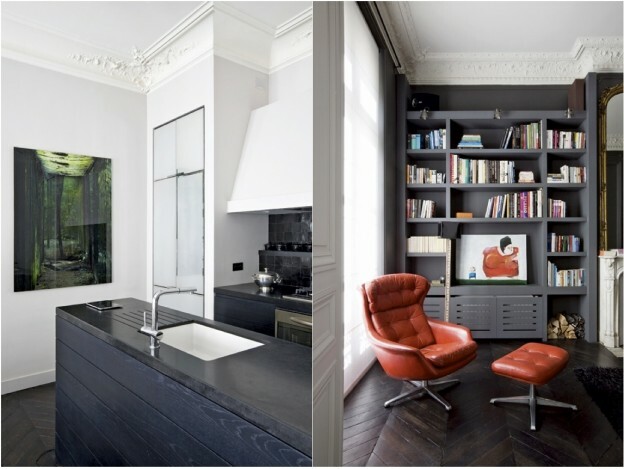 Dark stained parquet on the floors and black lacquered MDF panels provide the main surfaces off which the fixtures hang. Rich timber Danish mid-century furniture and a three-dimensional tone-on-tone wall hanging sit alongside other classic and vintage pieces in the living spaces. Sofas and chairs are neutral in colour, strong in form. The black-stained solid oak kitchen has a central island and Zimbabwe black granite worktop and tiled splashback. Jade green artwork provides the colour. An anthracite grey library is off-set with a vivid red 60’s armchair and footstool. The bathroom beautifully exemplifies the blend of old and new, with traditional fireplace, plasterwork and chandelier alongside colourful, framed lithographs and contemporary window treatments. What do you think of this mix of old and new? 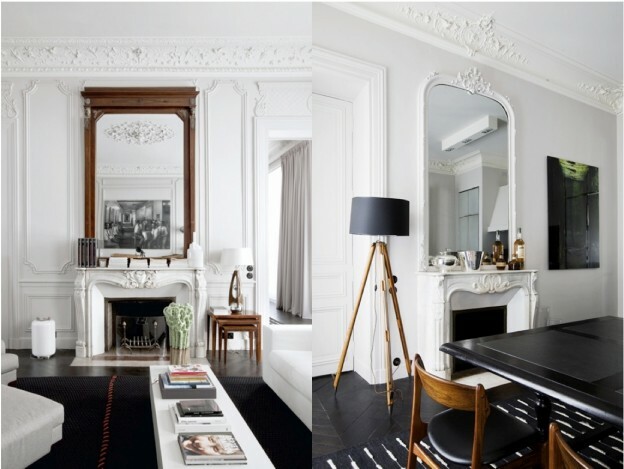 Which Paris apartment, part 1 or part 11, is your favorite? This entry was posted in wonderful spaces. 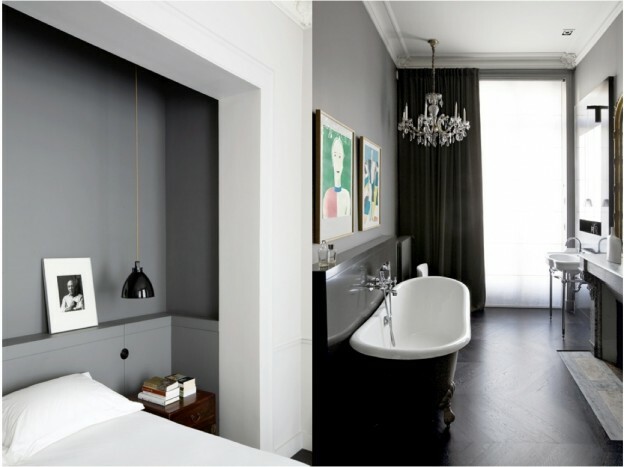 and tagged D Pages, design, Double G, Haussmann, interiors, Paris on November 13, 2013 by owls house london..
yes, that anthracite grey niche in the bedroom is gorgeous. I love the grey/white combination too. but my bedclothes never look like that!! I love this space. Thank you for the mention! a pleasure! thank you for the inspiration.